Events in August, midsummer and holiday time. Take a break in the Lacock area and visit lovely Lacock Abbey. Summer racing is still on at Salisbury Racecourse. Festivals, Devizes Carnival. Wiltshire is particularly rich in prehistory, take that Stonehenge Trek. Wiltshire Sportive - Short Sunday 4 August 2019. One for the family or a pleasant ride. Racing at Salisbury is to be on 14th, 15th and 23rd August 2019. Edington Music Festival. Priory Church, Monastery Lane, Edington, Westbury. August 18th – 25th 2019. "one of the most well-known festivals of music within the liturgy, bringing the music of European Cathedrals and religious institutions to this small community in rural Wiltshire". Bowood Summer Classic Car & Motorcycle Show. Bowood House, Calne. 18th August 2019. Castle Combe Circuit August Bank Holiday Race Day. August 26th 2019. Exhilarating! End of the Road Festival 29th August to 1st September 2019. Larmer Tree Gardens. Stonehenge Trek 31st August 2019 in aid of the Alzheimer's Society. A walk through prehistory. Tough! Mere is right on the edge of Salisbury Plain and Dorset. Like many other places in the area it is in an Area of Outstanding Beauty. Sometimes described as a village, sometimes a town. It is an enticing place with its attractive architecture, it is an area of outstanding beauty all of its own. Lacock. This is a beautiful area owned by the National Trust. The chocolate box village has been used as film sets including a Harry Potter film. Why not have a short break in nearby Chippenham and really enjoy Lacock. 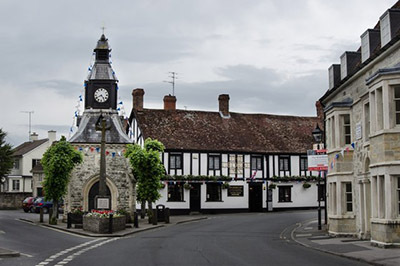 Wilton was once the county town of Wiltshire, hence the county name. Nowadays it is a delightful historic market town. 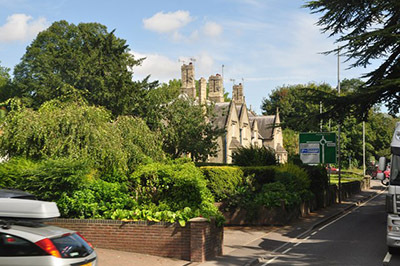 Wilton is also famous for Wilton carpets which are still made here. That resplendent Wilton House is on the edge of the town. Not surprisingly the house and the estate have been used for TV drama and films. Salisbury Racecourse. A summer flat racing venue and a very attractive one. It is situated near Netherhampton a few miles from Salisbury. Barbary Castle is actually an Iron Age Hill Fort and part of the fortifications of the Ridgeway. Like all those forts it is situated on top of a hill so that the defenders could see what was going on around them. This one certainly does! The Romans liked it, so did the Anglo Saxons and even the War Ministry during World War II. Devizes is an attractive market town with its green in the centre. It still has its market once a week. Pick up the Medieval Trail leaflet and wander round the long and turbulent history of this charming town. Larmer Tree Gardens near Tollard Royal in the Cranborne Chase is a captivating venue for many events. Lovely gardens. 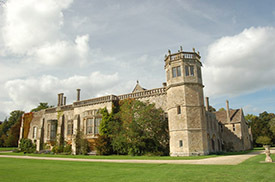 They are English Heritage Grade II listed in the Register of Parks and Gardens of Special Historic Interest in England. They certainly deserve it. This time of the year it will be a splendour of colour.